Curating insights from some of America's greatest Christian minds, High King of Heaven is a series of reflections on Christology, one of the church's central doctrines. It contains essays from over twenty well-known pastors and theologians, including John MacArthur, Mark Dever, Albert Mohler, Miguel Nun~ez, and Ligon Duncan. 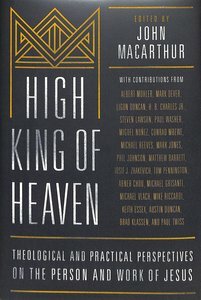 About "High King of Heaven: Theological and Pastoral Perspectives on the Person and Work of Jesus"